“A little child of five years of age, seated in a stage box at a Liverpool theatre, listening intently to the strains of Verdi’s Traviata; then, taken the next day to call on the prima donna, lifted up in her arms, and embraced affectionately. This is my first musical impression.”- from the autobiography “My Art and My Friends”, by Sir Frederic Hymen Cowen (1913). On the 29th of January 1852 in Kingston, Jamaica, at a house now presently numbered 90 Duke Street, a musician of no ordinary talent was born. 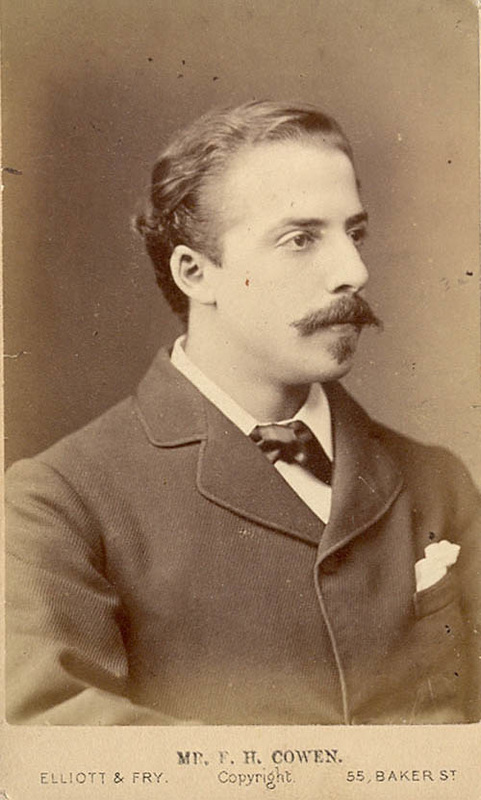 His name was Frederic Hymen Cowen and he was to become one of the leading musical virtuosos of his time, likened to then contemporaries such as the formidable Lizst and Brahms. He was the fifth and last child of Frederic Augustus Cohen and Emily Cohen (born Davis) and his parents knew he was destined for greatness. In his autobiography Cowen writes a delightful and chucklesome anecdote in reference to his mother, that “…she felt sure I was going to be a musician by the pronounced habit I had of lying on the floor and drumming with the heels of my shoes, much to the detriment of the said shoes and of her pocket”. When Cowen was only 4 years old his family moved to 11 Warwick Crescent, London, England, where his father became treasurer to the opera at Her Majesty’s Opera (now known as Her Majesty’s Theatre) and William Humble Ward’s private treasury. Like many musical geniuses, Cowen showed astonishing abilities from an extremely early stage in his life. It became obvious very quickly that Cowen was destined to be one of the most accomplished artistic minds of his day. He composed Minna Waltz at just six years old, an operetta called Garibaldi to his sister’s libretto at eight years old, and a symphony at age seventeen! He first appeared publicly as a pianist at the tender age of nine, by accompanying singer Mrs. Drayton on a song he himself wrote at a concert in the early 1860s. On December 17, 1863, Cowen performed his first public recital at the grand ‘Bijou Theatre’ of the old ‘Her Majesty’s Opera House’. In 1864 Cowen performed the Piano Concerto in D minor by Mendelssohn at a concert at the London home of the Earl of Dudley. Cowen’s first musical teacher, and indeed his earliest musical friend, was one Henry Russell. With the assistance of the Earl of Dudley Cowen was later able to study piano with Sir Julius Benedict, and composition with Sir John Goss, but his lessons with both came to an end when by autumn of 1865 they felt they could do little more to further his musical education. It was time for Cowen to broaden his horizons. His instructors recommended that he continue his education in Germany, at the time a major Mecca for classical music. Coincidentally at this time the reputable Mendelssohn Scholarship competition was to be held, which awarded 3 years of tuition at the Leipzig Conservatory. Now was Cowen’s chance to receive a priceless opportunity to expand his musical landscape. He attended the examination and was awarded the prize. At the conservatory he worked with masters such as Hauptmann (harmony and counterpoint), Plaidy (piano), Moscheles (piano), Reinecke (composition) and David (ensemble work). Cowen’s time at the conservatory allowed him to interact with musicians from other countries and languages, enabling him to develop and retain exceptional musical technicality. Cowen later attended the Stern Conservatory in Berlin, Germany in 1867 to study conducting under the esteemed Friedrich Kiel. The Stern Conservatory was a prestigious institution, with many notable attendants and alumni, that was later absorbed into the Berlin University of the Arts. As a seasoned musician, Cowen met many of his prominent contemporaries over the course of his musical career. 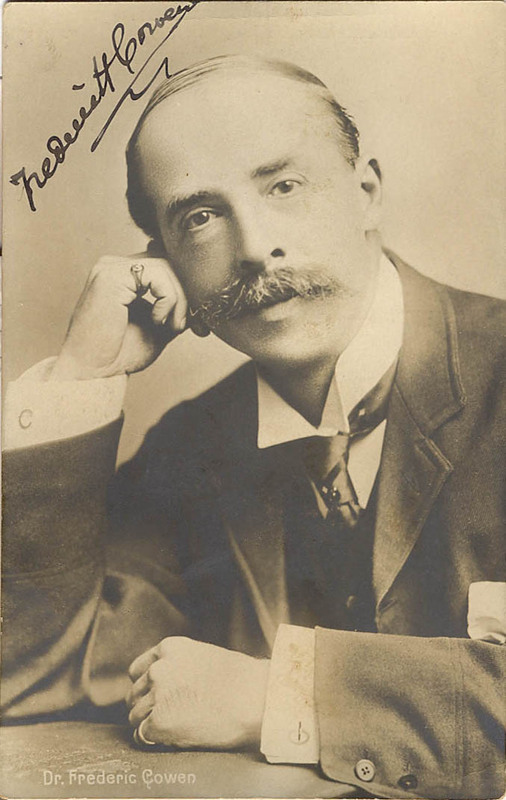 He gives an intriguing and hilarious recollection in his autobiography of conducting none other than Edward Elgar, one of the most accomplished British composers of all time. 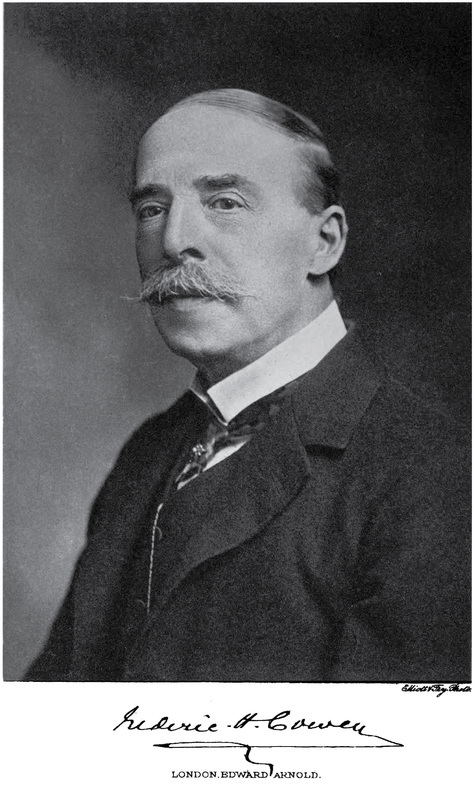 Elgar was appointed Master of the King’s Music in 1924, and received international attention after composing Enigma Variations in 1899, and a year later The Dream of Gerontius. He is perhaps most known in modern times for the exceedingly famous Pomp and Circumstance Marches (1901 – 1930). To this day several of his works remain in the international classical repertoire. In 1888 Cowen was commissioned to organize a gigantic music festival in Melbourne, Australia, as well as to act as conductor-in-chief and musical director. His work on this project was a prime example of Cowen’s unique knack for everything music, and his pristine work ethic. The festival was intended to accompany the International Centennial Exhibition, and Cowen brought with him several of England’s greatest musicians, including leaders for the various orchestra sections. Cowen was able to bring numerous, unbelievably skilled musicians together, organize and plan a national event and this accomplishment is commendable in its own right. For his work on the festival, Cowen was offered 5000 GBP for the proposed six-month period, a sizeable payment at the time, and indicative of how much his work was respected. In his true prolific fashion, Cowen gave an astonishing 263 performances over the period of the exhibition, 211 of which were purely orchestral. This is said to be an endurance course unmatched and unrivalled in musical performance history! He expressed his exceptional versatility by covering in a very faithful and authentic way the popular musical repertoire of the time. He is renowned in Australia for his work on the concert and also significantly for being the first to introduce Australia to a large number of musical works that were well-received in Europe at the time. The gargantuan music festival proved to be a truly special event for Australia. Cowen continued to be quite the dynamic conductor. In the same year as the Melbourne festival he began his first period as the regular conductor of the Philharmonic Society in London. He held the office first from 1888-1892, and then again from 1900-1907. In the intervening years he took over as conductor of the Halle Orchestra in Manchester and then the Scottish Orchestra in Glasgow. He further directed the triennial festivals at Cardiff and the Handel Festivals at the Crystal Palace. Unfortunately, with the arrival of war Cowen’s public appearance opportunities virtually ceased, but he persevered with music all the same, even under the tense and dangerous conditions of the war. On the coronation of King George V Cowen was knighted in 1911 at St. James’s Palace. Among his other accolades is a Doctor of Music degree conferred on him by the University of Cambridge and the University of Edinburgh. In addition, he was appointed Professor of the Guildhall School of Music in February 1918. Cowen is said to have been amongst the most protean composers of his day, quite likely a result of his diverse musical education and travels. He completed composition of a piece for a full orchestra on January 1, 1934, based on a German ballad by Ludwig Uhland, which was later written in English by Henry Wadsworth Longfellow, entitled ‘The Luck of Edenhall’. Among his symphonies The Scandinavian proved to be the most successful, and is indeed arguably his most popular work overall. 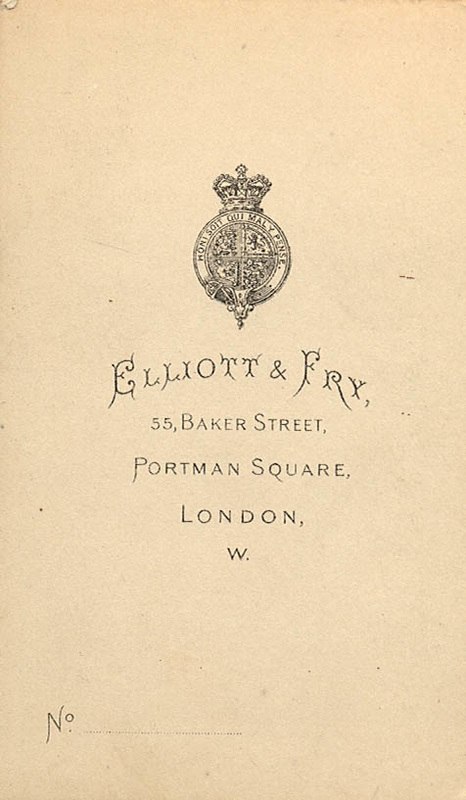 It was first performed at St. James’s Hall in 1880, remaining well received for over a decade and becoming one of the most widely and repeatedly performed British symphonies. From this work he acquired not only national but international fame. Throughout his career Cowen wrote over 300 songs, 4 operas, 4 operettas, 6 symphonies, 2 sacred cantatas, 11 secular cantatas and many other works. His high art songs led him to be admiringly referred to as “the English Schubert”, a compliment of an exceedingly high order. On Thursday, February 7, 1929, Cowen returned to Jamaica after an absence of over seventy years. On the very afternoon of his arrival he was ceremoniously presented at the historic Institute of Jamaica with two addresses: one by the Board of Governors; the other accompanied by an exquisite souvenir in the form of a manuscript music holder made of the native wood mahoe, inlaid with Braziletto root, yacca and satinwood, with the silver plate cut to represent Jamaica, a souvenir of near mystical beauty that was presented to him by several Jamaican music lovers. Such a warm welcome was fitting of a Jamaican who had made such an overwhelmingly brilliant contribution to classical music. Set I of his orchestral work The Language of Flowers, Suite de Ballet (1880) was played a few days later on February 12 at the celebrated Jamaica Ward Theatre. Mrs. E.N. deMontagnac was the conductress of the resplendent performance. Cowen married Frederica Gwendolin Richardson at Marylebone Registry Office in London on June 23, 1908. Having lived a full life, he died in London on October 6, 1935.